LIGHT UP SHOES SPECIAL SALE! Everything was smooth. 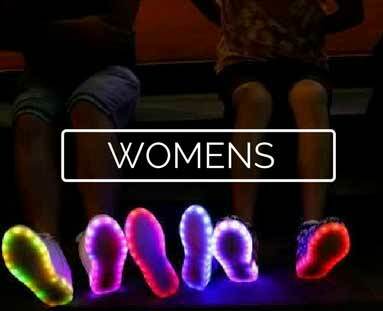 Fantastic led shoes with perfect working remote and flashy lights. My little boy loves this shoe, he keeps demanding for another. The 48 hrs delivery was awesome, kudos! to their responsive customer care. Great Service!! They shipped a pair of black Led sneakers I bought from them in 3 days. The shoe was exactly as described without defects. My kid is so excited, He’s already in love with them. I ordered two pairs of Led shoes- a red and a black for my son’s birthday. 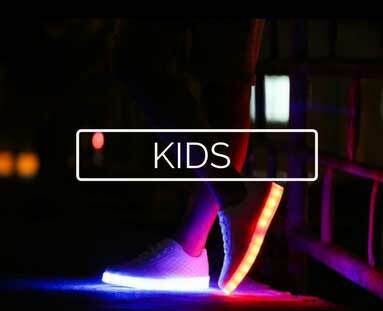 Kids have been complimenting the Led shoes, while some parents showed great interest.I have recommended you guys already. Would you like something more exuberant to wear? 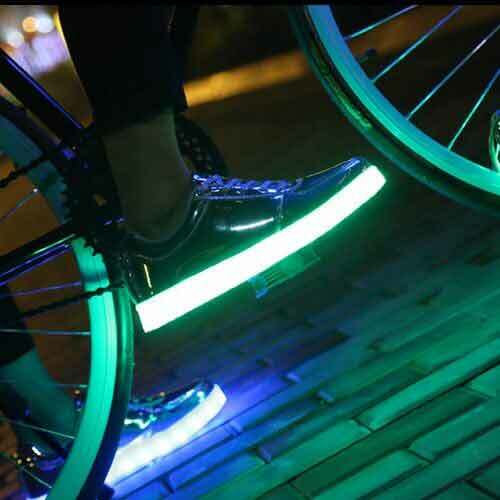 Then our Bright LED shoes with luminous soles are really for you. With the control button, choose between 7 different colors, flashing white light or varying colors. This way you are always in the spotlight whether day or night. Also thanks to the included USB cable, you can easily charge the shoes using a computer or mobile power bank so you can enjoy these colorful cool sneakers for hours on the go at a party or event. Our shoes are currently up for grabs all across the US, U.K., Australia, and Canada. Well here they are, durable, bright lights and wearable in all kinds of weather for partying outside. Since the early 90’s light up shoes have always been popular among adults and kids. 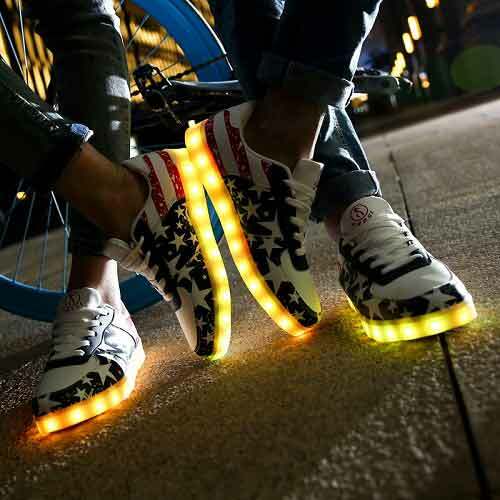 Shoes that light up on the bottom were commonly known as led sneakers and the most popular brand was LA Gear. Fast forward a decade and they have made a comeback with a tech upgrade including usb charging and light switch remotes. In 2016 our sneakers were first made popular from a viral youtube video that had a girl dancing to electronic music and further on in an Olympics 2016 ceremony when the stadium went silent and everyone lifted their pairs of shoes in the sky to show off their red and blue lights. Whether you are going to a concert, party, or a night out on the town these will be sure to turn heads. If you are heading to a festival our led lights last for 6 hours on one charge so you can dance the night away with no worries. Don’t forget to pick up our other accessories such as our led fidget spinners to complete the look. Why buy light up sneakers from us? We have been manufacturing and supplying wholesale shoes to retail stores and online marketplaces since 2016. Our unique collection of shoe styles and colorways are also a fashion staple. The available colors go with every emotion, feeling and vibe you’re having the day you wear them. For decades, these shoes have been popular among kids, teens, and adults across the world. They’re only now coming back into style with growing numbers as more and more rush out to grab there pair. 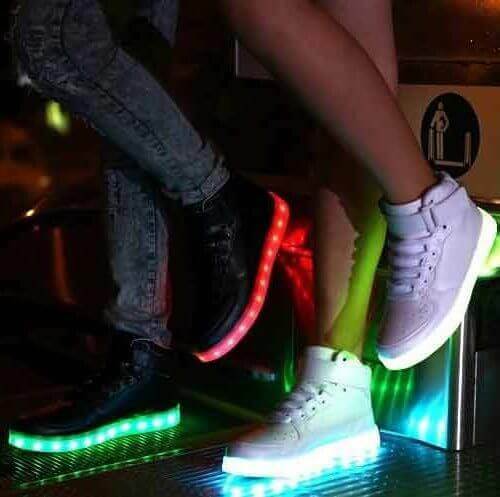 Our shoes include high quality bright led lights, change color and are wearable in all weather conditions. They feature a switch to turn the lights on or off and change between solid or multi-color light mode. 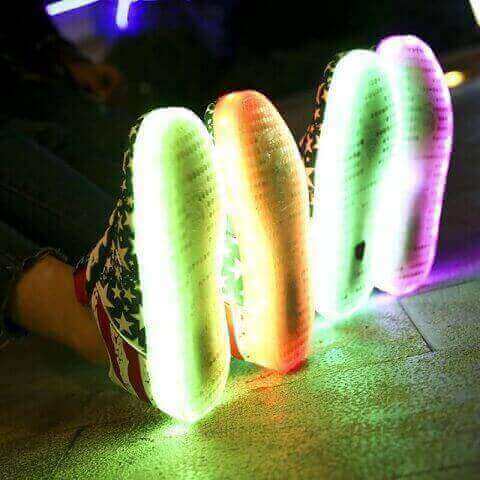 Our led light up sneakers are easily rechargeable via USB through your computer and flash in various different colors from red to white. Conserve the battery during the day by keeping the switch off, then once the sun goes down turn the switch on and watch them glow! All of these are capable of fitting your lifestyle perfectly. Simple choose the style that you like and begin to light up your life with some LED lights! Wear them at a party, festival, event or anywhere you wish to stand out at. Because you will stand out and cause heads to turn as people witness your unique and bright footwear. Popular among kids to adults these sneakers are all of the rave across america and worldwide. What led shoes sizes do you have available? Our shoes tend to run a half size smaller than the normal, standard shoe size. Please refer to our size chart to find the best size suited for you. If you are visiting our website from outside america you may also view our guide in euro sizes. These shoes great for people of all ages including kids, teens and adults alike. They can be perfect for attending a party, festival, or event such as a wedding. Show up looking as flashy as ever with your awesome comfortable sneakers and dance away the night. 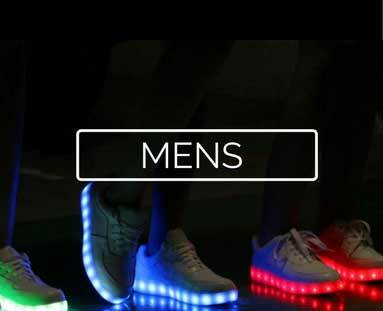 During the day, without the LED lights on, these sneakers are a fashion sense for the world of today. The style of the sneakers have been wearable since the 90’s, and they’re getting even more popular today. The simulation light shoes turn on and off by a switch that lies on the inside of the shoes. The switch can power on the shoes and light them up in different colors. To power these shoes, you can easily hook them up to a USB charger at the end of the night. All of our shoes included a usb split cable so you may charge both sneakers at the same time using your mobile charger or computer port. Charge it up in less than 3 hours, and as they charge they’ll light up a solid red color. All of our sneakers come with a USB split cable capable of charging both sneakers at once. The charge lasts for up to 6 hours, so that’s just enough time to enjoy another full day or night of LED fun! What colors are available to light up? Not only do they light up, but we currently offer eleven different lighting modes. That includes strobe, flashing and more. They will last longer if you maintain them on certain colors that are less light intensive such as pink and blue. Brighter colors such as white consume more battery power which may shorten your wearing time. Are the bright shoes durable and waterproof? Not only are our products made with high quality long lasting bright lights but they are made of premium leather materials that last a long time after multiple uses. Another great feature is that they’re waterproof. This means you can show off your new shoes in any weather. That includes rain, snow, fog and more. They’re waterproof, but can’t be submerged into any water as to avoid any damage to the battery which may burn out the lights in your shoes. Just avoid long term use in troubling weather and they will last years to come! 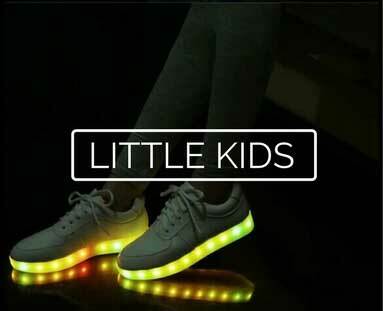 Are light up shoes for kids safe to wear? Wearable by people of all ages, from children to adults, our shoes are 100% safe. They are made with top-quality lithium batteries. These batteries are constantly tested to ensure the safety and usability of our products. The sneakers are worn just as any other sneaker as the battery and wires are tucked away in safe areas to avoid contact with the soles of the feet. Our sneakers do not emit enough heat in long intervals to be unsafe to our customers. We are committed to the safety for our customers and quality of our products which is why we include a 30 day warranty on all purchases. How do I clean the light up shoes? You can easily clean your shoes by taking a dampened cloth to wipe away any dirt or impurities on the surface. We advise you not to use a laundry machine to wash the sneakers as it could damage the inner battery and wiring. Some of our styles such as the light up trainers, gold, and silver styles are not suited for rainy weather. For best care and long term use it is best to not have long term exposure to water. Do you sell led shoes in Canada, UK, Australia, and other international countries? We currently do ship throughout all of Canada. It may take longer than local shipping, but please refer to our shipping policy for estimates on your delivery. We also ship our shoes across the Europe and other countries. 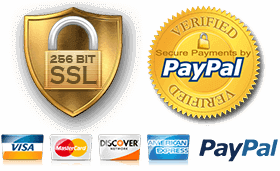 All of our packages are insured and come with tracking number which are emailed to you at time of shipment. Please visit our customer faq page for more info on bright shoes.